Trick Or Treat! It's the big day if you have trick or treaters going out down to door tonight! Just make sure if you are out and about with some trick or treaters, that you stay away from wear wolves, haunted houses, ghosts and graveyards! Started with a base of OPI Fiercely Fiona, China Glaze Sunset Seeker, KBShimmer Hide and Eek, China Glaze Shadies & Gentlemen and Zoya Mira. Most are three coats; the index and pinky are two. 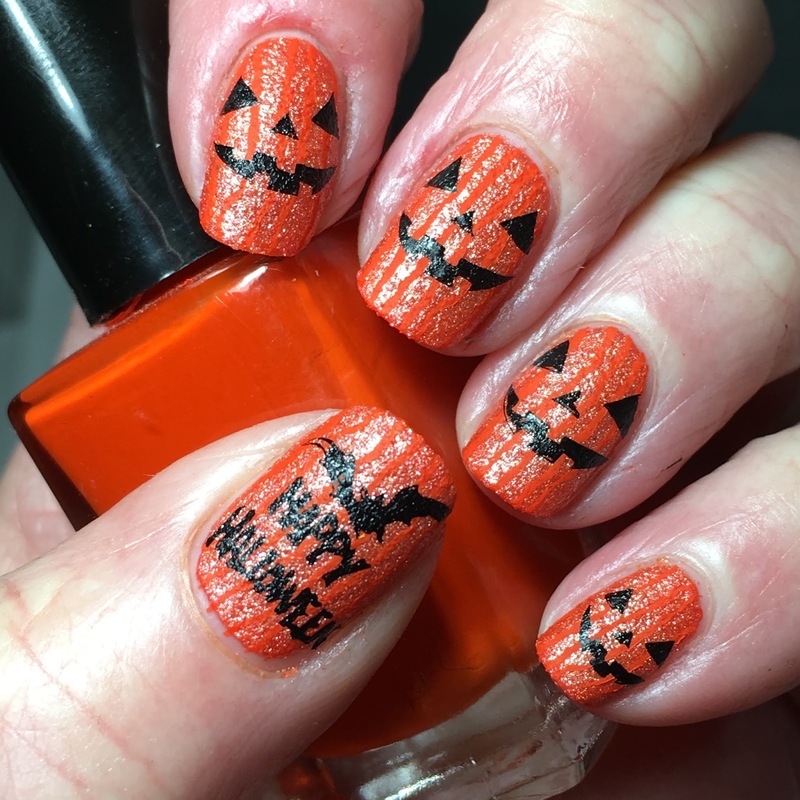 Made stamper decals for the index using Delaney Halloween 006 and pinky with MoYou Festive 16, and stamped thumb using Chez Delaney Halloween 002, middle and ring using MoYou Festive 16 using MdU 1, 2, and 13. The lights in the haunted house and the RIP are MdU 27. 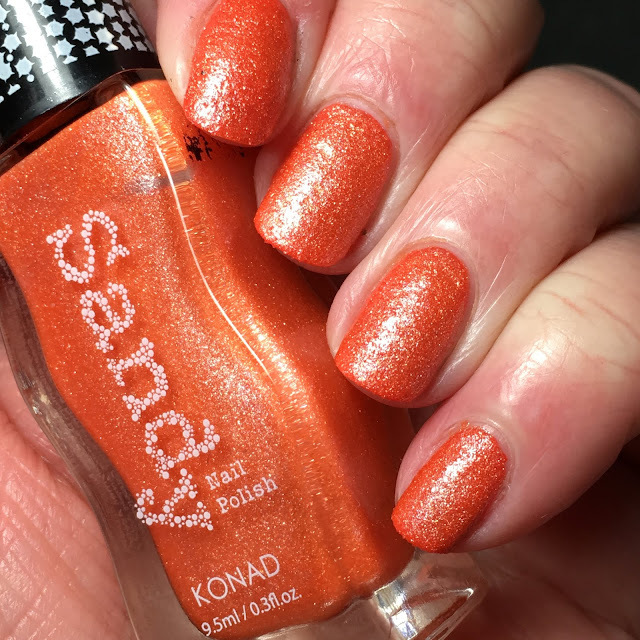 Topped with KBShimmer Clearly on Top on all fingers except ring to finish. If you are out with the trick or treaters tonight or you are giving out candy like me, have a fun and safe Halloween! It's scary to think Halloween is tomorrow and I've only posted a couple Halloween mani's! I finally got my computer situation sorted out to do some posts; now if only I had more time to do some posts! 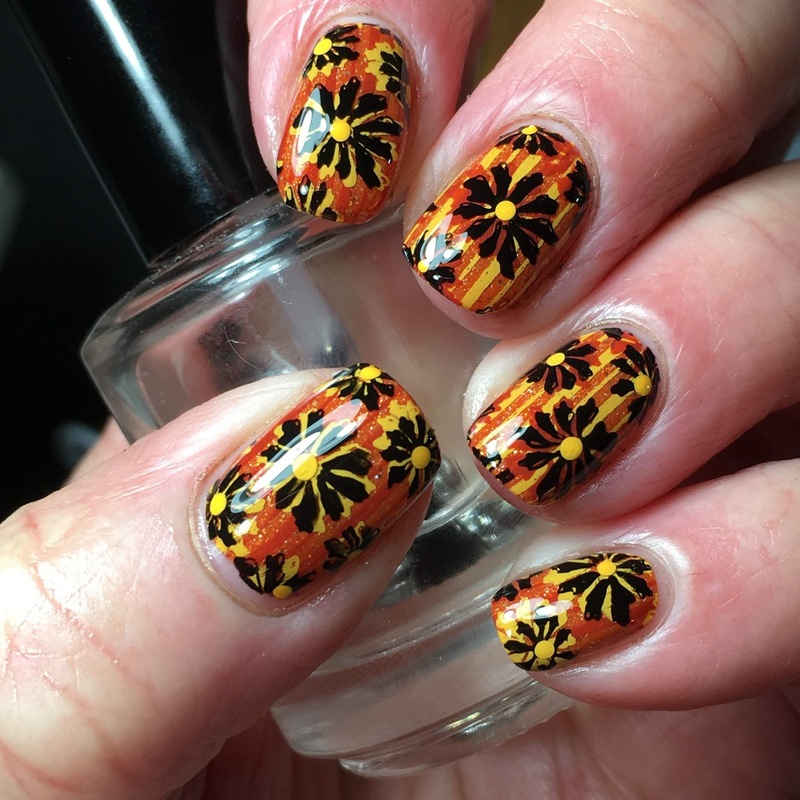 I hope to post today and tomorrow and, well, the rest of the mani's I did will have to hold over until next year! Hopefully I'll do better next year! 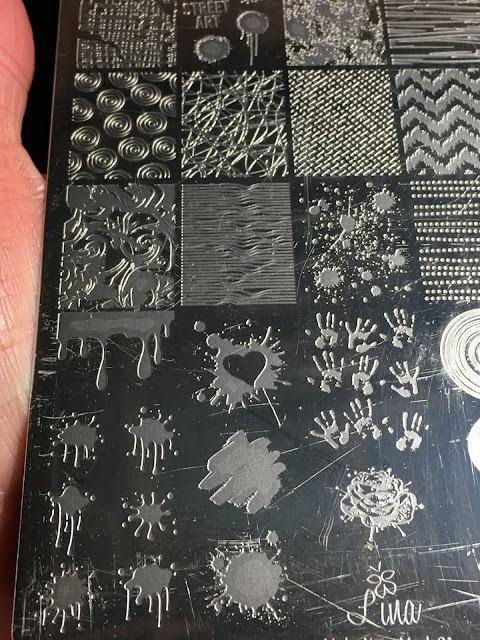 Here's what I came up with! Started with three coats of China Glaze Shadies & Gentlemen, no top coat. I was in love when I seen swatches of the polish; I loved the super matte look of it and was so excited when I found it! That was until I applied it; what a PITA streaky mess and way more finicky than I like in a bottle of polish. 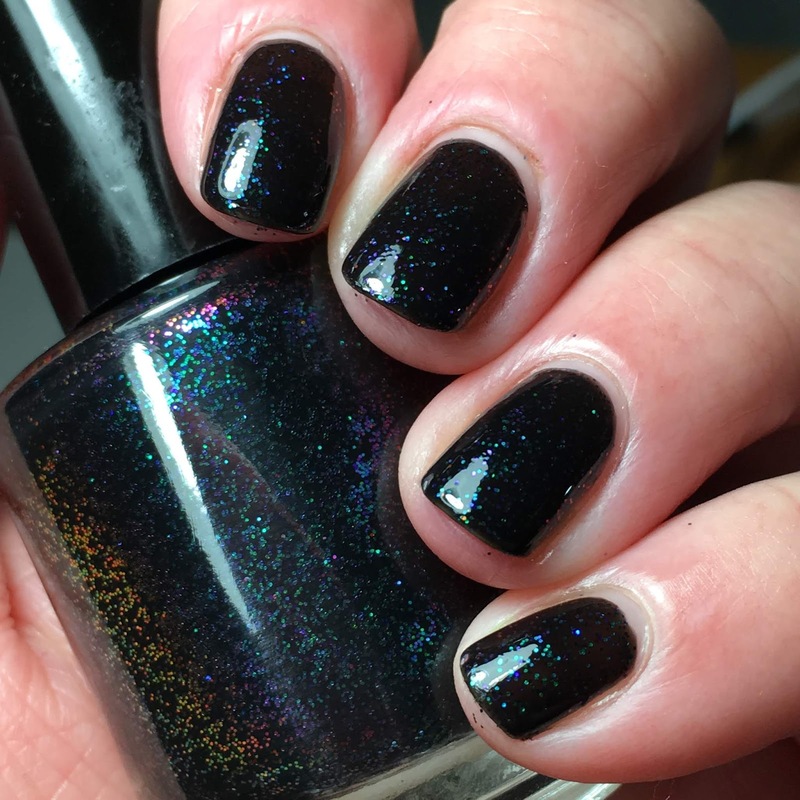 I was even thinking I needed a back up but I think myself I will stick to regular black with a good couple coats of matte to get same effect. I seem to recall that it was best to apply directly on the nail but that goes against my need to apply a base coat grain of thinking even if it gets best application results. 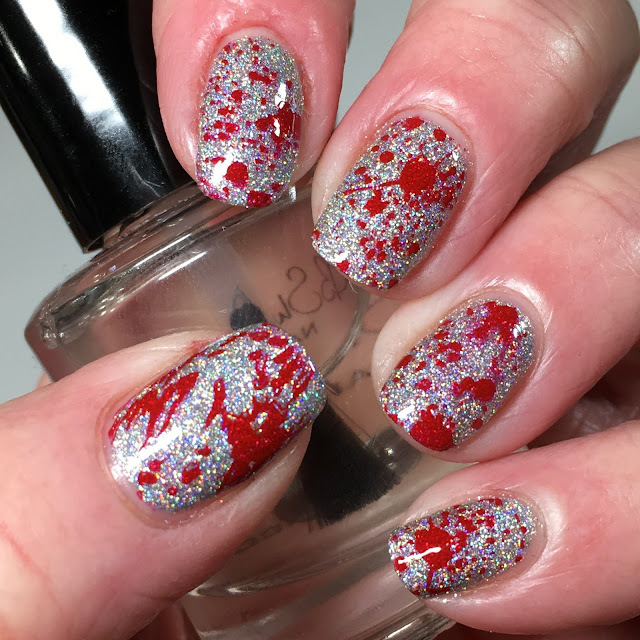 Stamped using MoYou Festive 16 using MdU 1 with an accent of Lina Make Your Mark 08. Lina Make Your Mark 08. You know my love of busy and my love of adding dots when I can so added dots using MdU 107 for filler and burst of colour. But ultimately I liked the matte look best so added a coat of matte which is how I wore it out and about! 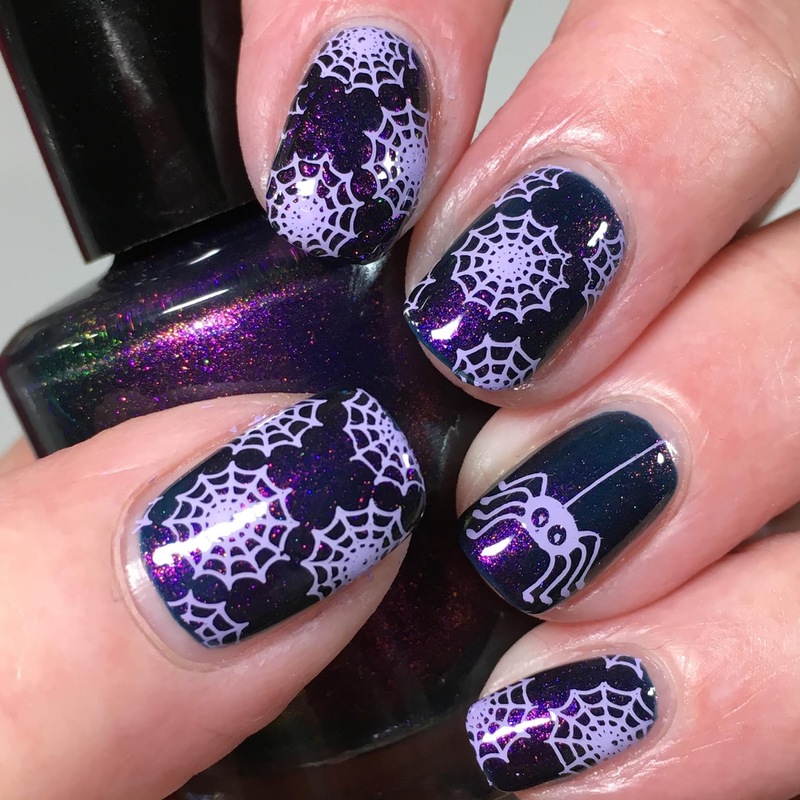 You may not believe this but these were actually my attempt to do some neutral, office appropriate yet Halloween themed nails! Ha ha! 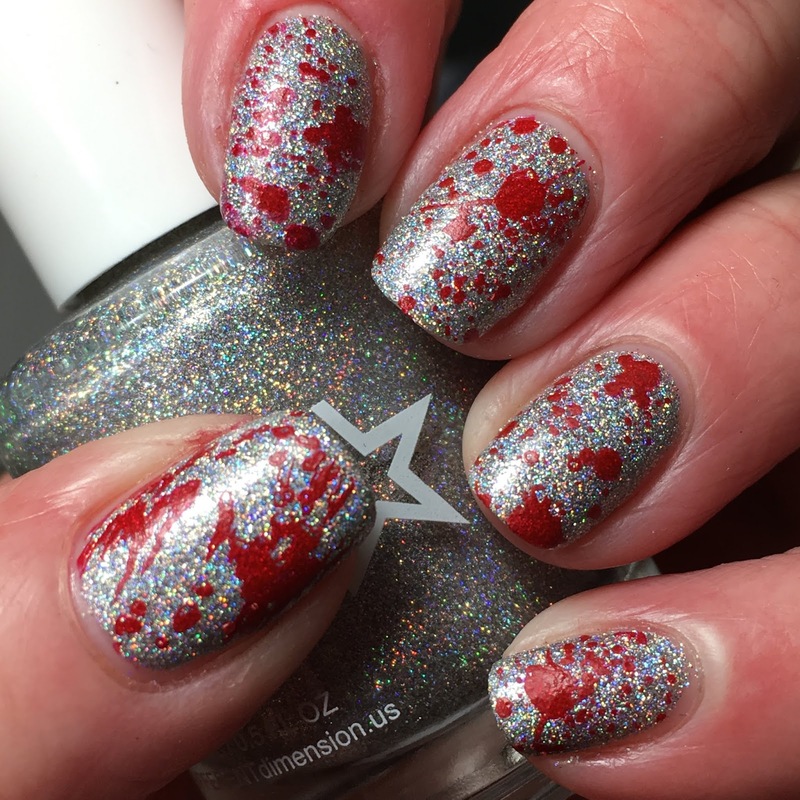 The silver holo is so much more neutral than the typical orange, purple, black nails so I went with this holo base and because I was wearing a red jacket, went with red stamping to match. 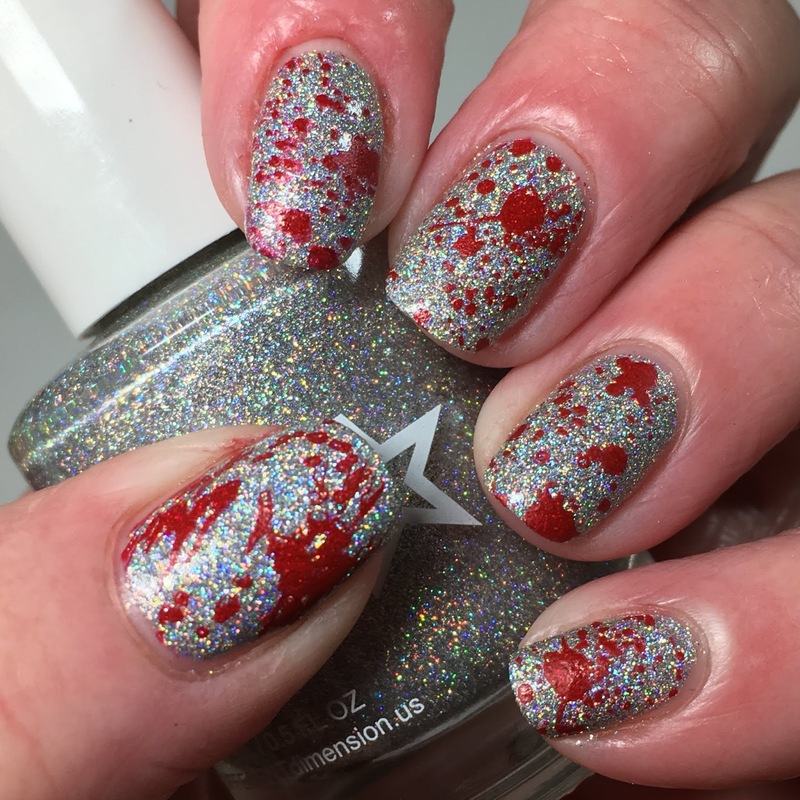 I was thinking what red stamping goes with Halloween....gory blood nails! This is what I came up with! 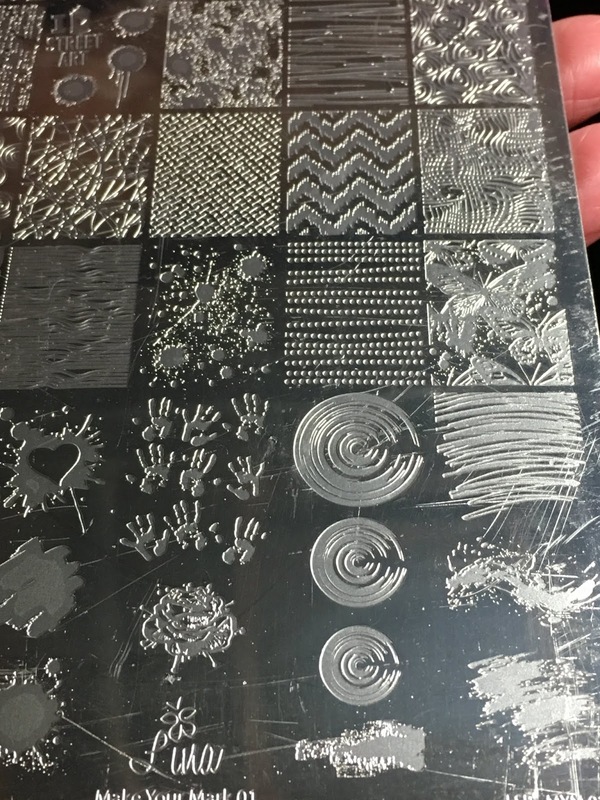 Started with two coats of Different Dimension Kiss Me Under The Light of a Thousand Stars. 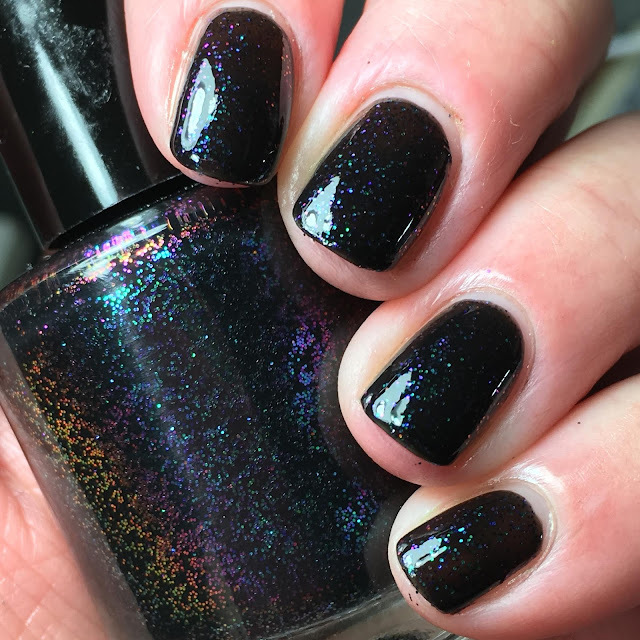 I have reached for this polish soooo often; it is my new go-to polish if I can't decide on anything. 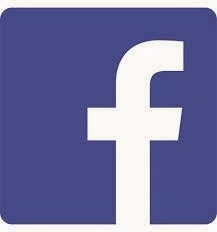 And I use it like a neutral even though it is nothing but! Stamped using images from Lina Make Your Mark 01 on all nails except thumb, which is Dixie Plates Halloween 2017 using red Konad stamping polish. Lina Mark Your Mark 01. 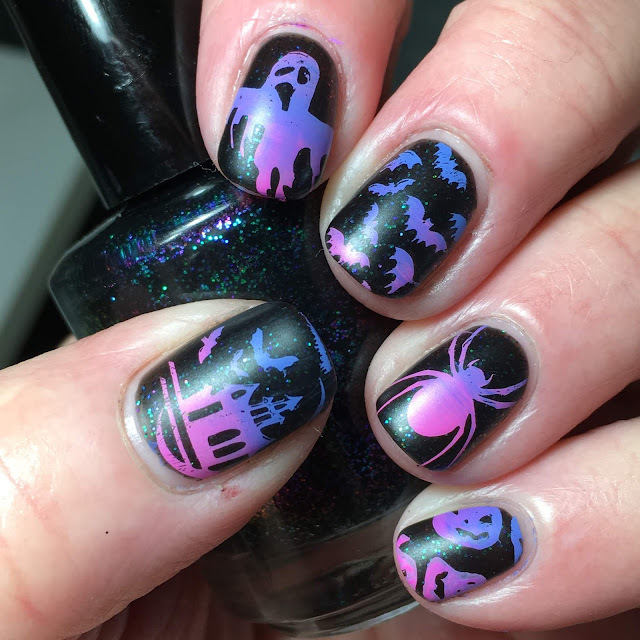 I have a few more Halloween mani's to post but am having computer issues so I may be only able to share on IG until I get them resolved but hopefully will get them up before Halloween! I finally have a Halloween mani to share! 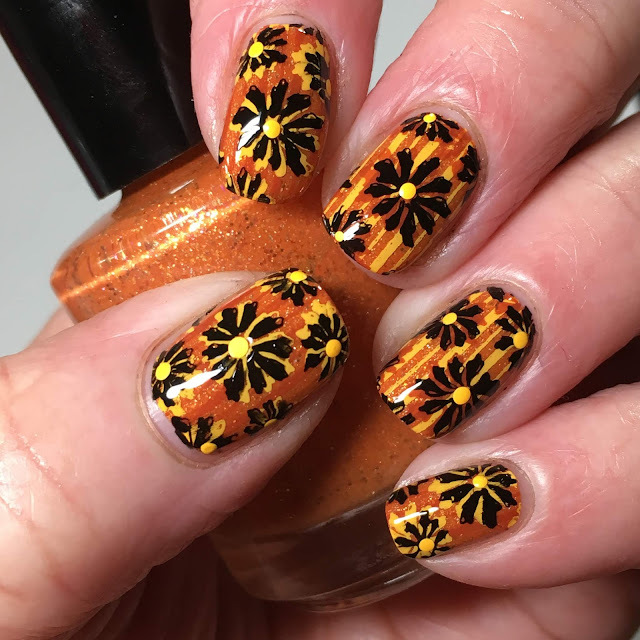 I had/have so many fall ideas that I had been doing mani after mani after mani that are more suitable to fall nails but thought I had better get in a Halloween mani or two before I run out of time! 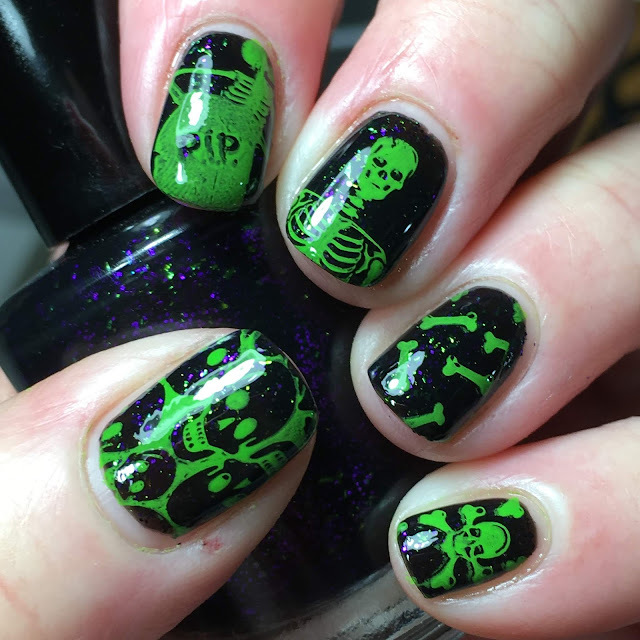 Here's my first Halloween mani; there will be a couple more to come! 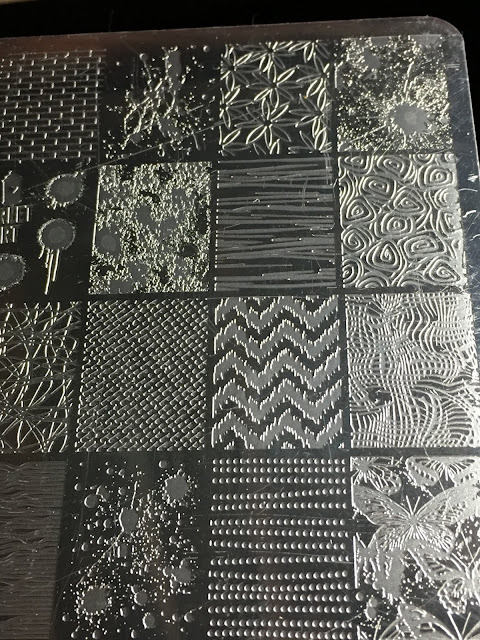 Stamped lines to mimic pumpkin lines/ridges using Lina 4 Seasons- Summer 02 using MdU 13. Stamped images from Chez Delaney Halloween 002 using MdU 13. I love these face images; I think I use them every year at least once! 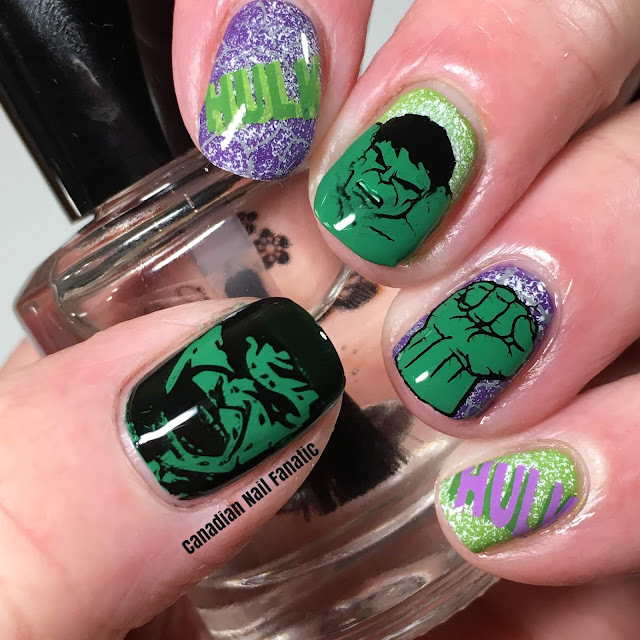 I thought these were super cute; I even wore them for three days; that was until the faces started to come off which happened as no top coat to keep the textured look. 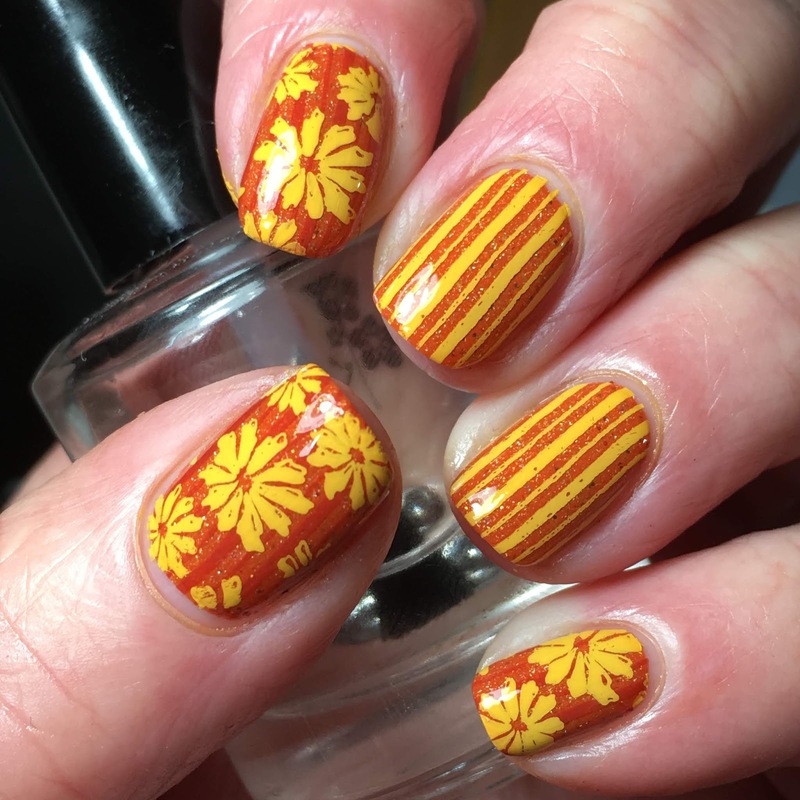 Do these 70's vibe nails give you a hint of the TV show they are inspired by? One of my favourite shows, maybe because it was the era that I grew up in. Based upon That 70's Show, these are my day 4 tv show nails! Started with a base of two coats of Girly Bits Sample 041217. I can't quite remember if I got this at Indie Expo Canada or if it was part of the mystery trios that are sold online on the GB estore but one or the other, I ended up with it! 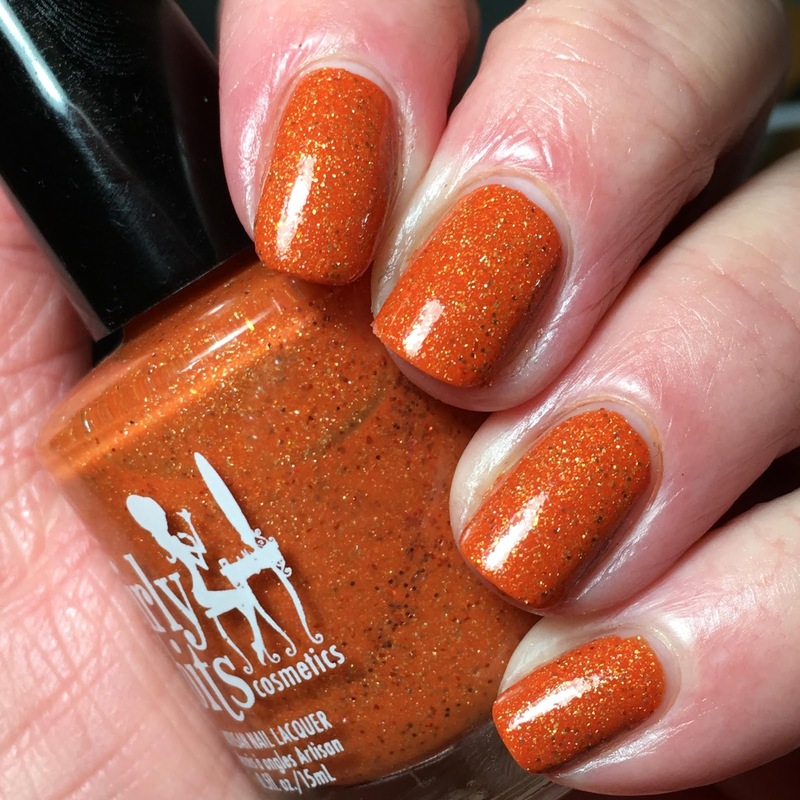 Love, love, love it; such a perfect fall/Halloween colour! 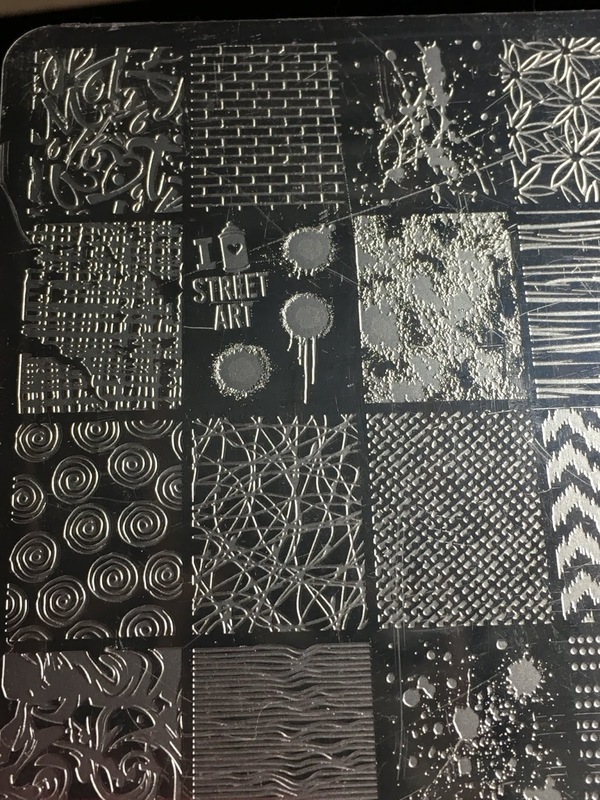 For those who may want to know, I compared it to Girly Bits Funky Town as I happen to have it as well. Not the same by any means. 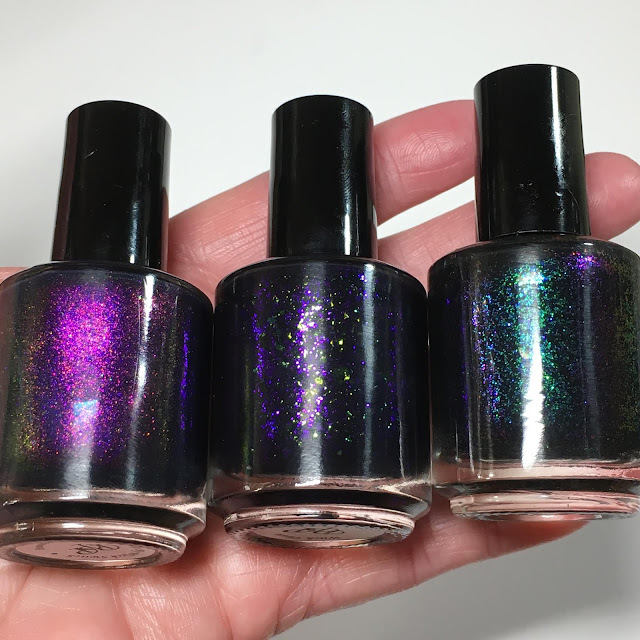 Every so slightly different base and colour base, Funky Town has way more holographic glitter and there are different glitters, maybe even flakies in the sample bottle. 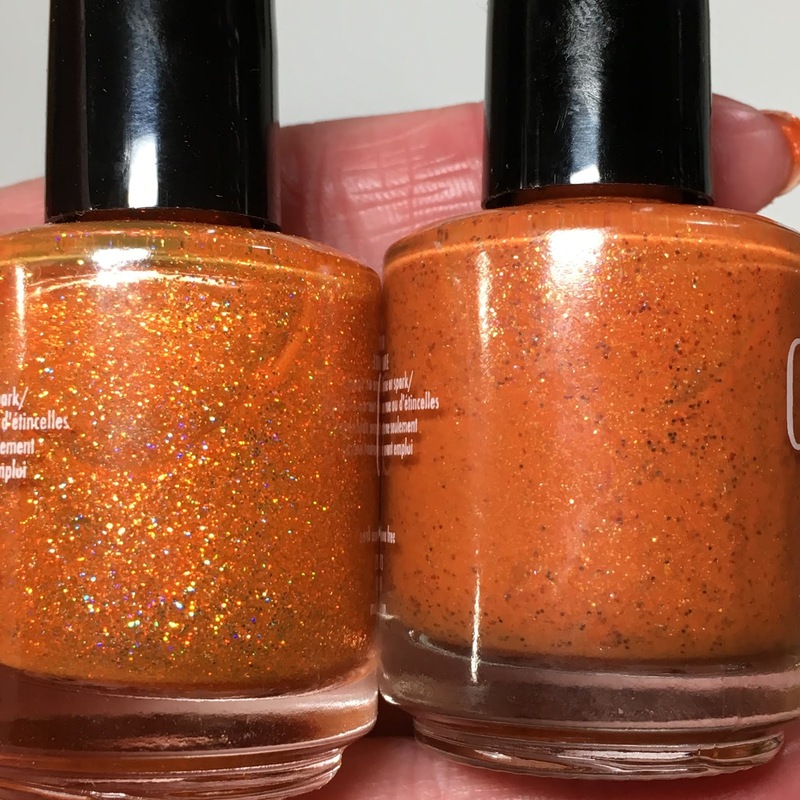 I wanted to compare the sample with other brands; some that come to me off the top of my head are Picture Polish Autumn, SpaRitual Kindness, but I forgot. Another time perhaps! Regardless, I really love this sample! 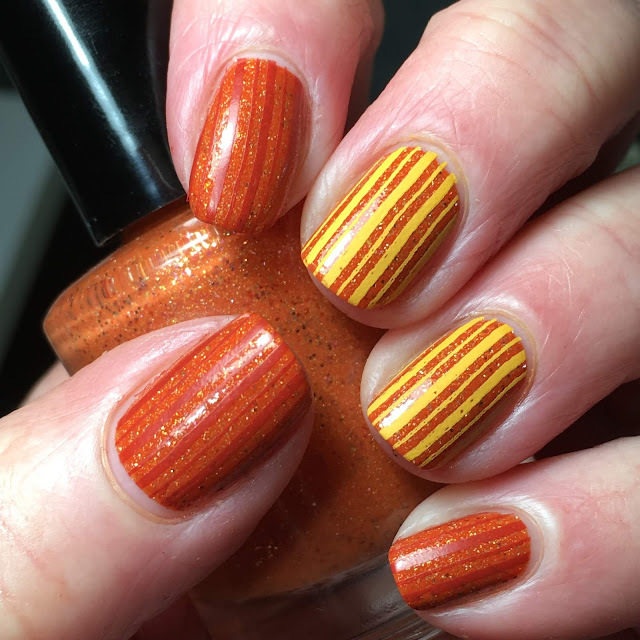 Stamped some stripes using image from Lina Born to Sail 01 using MdU 106 and Painted Polish Stamped in Sweet Potato. 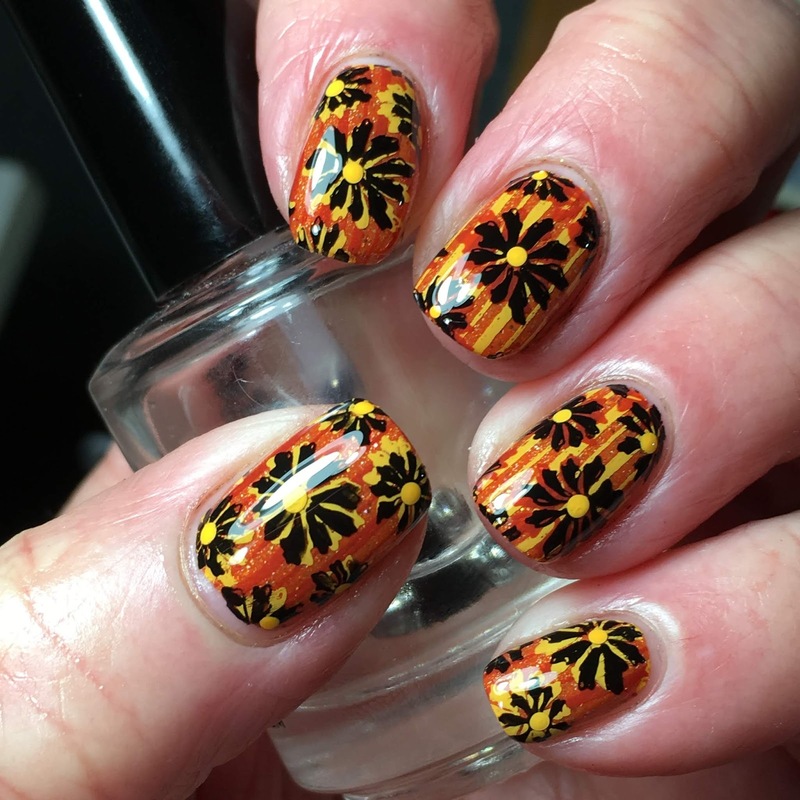 Stamped accent nails with image from Lina 4 Season-Spring 01 using MdU 106. 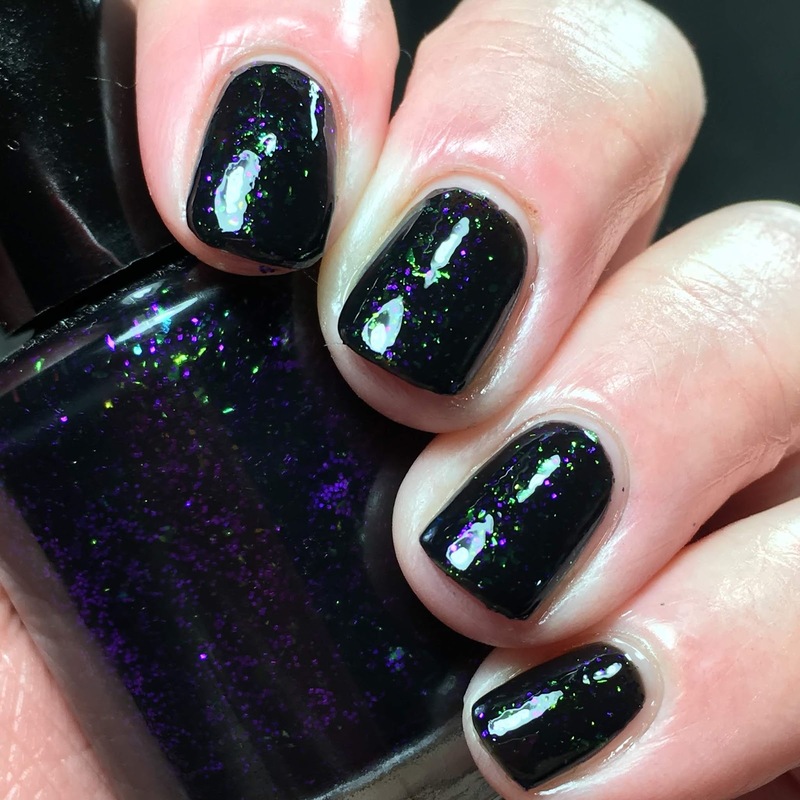 Topped with KBShimmer Clearly on Top. For what I thought was the finish but it wasn't! Decided to stamp on ring and middle using same image from Lina 4 Seasons-Spring 02 using Painted Polish Stamped in Sweet Potato. It didn't quite have the coverage that I would have liked. So shadow stamped those nails and then them all using MdU 2. 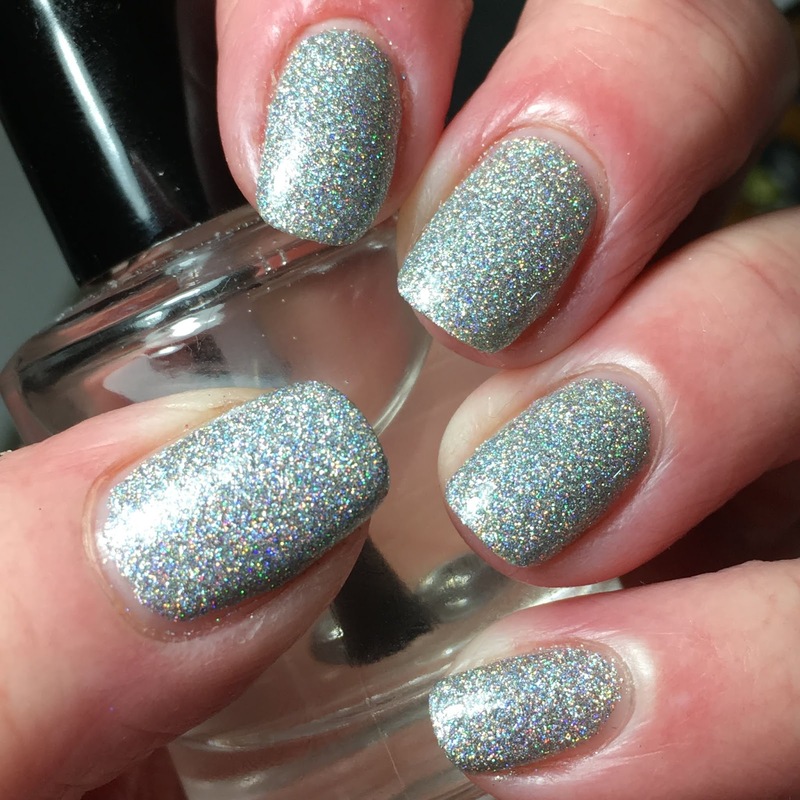 Topped with KBShimmer Clearly on Top to (really) finish. 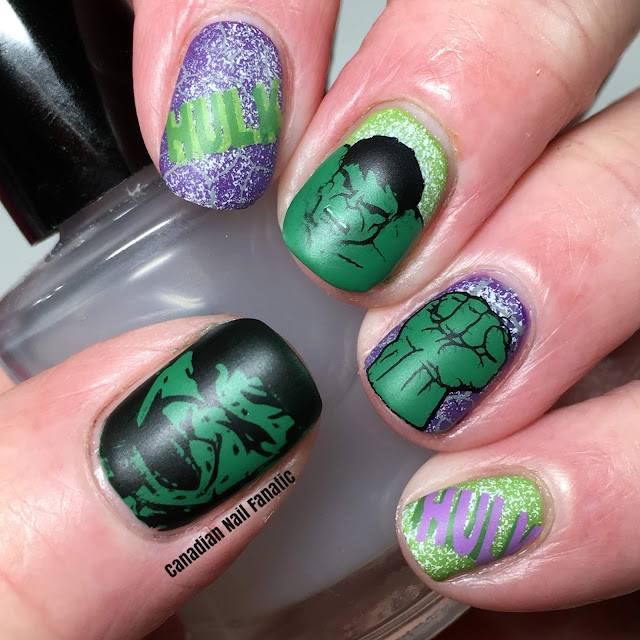 I really love these nails! 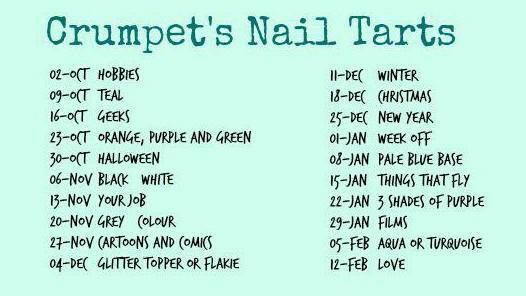 The colours might be a little unusual and they are busy but funky cool for sure! And maybe the real reason behind why I love them is I recall my parents having an accent wall in their dining room that had almond and terra cotta coloured striped walls and then they took dark and lighter daisies from a roll of border that looked similar to these and cut them to make decals then pasted them on the stripes and these nails bring me back to that time in my life! But who knows, it could be because I like the funky groovy look of the 70's! 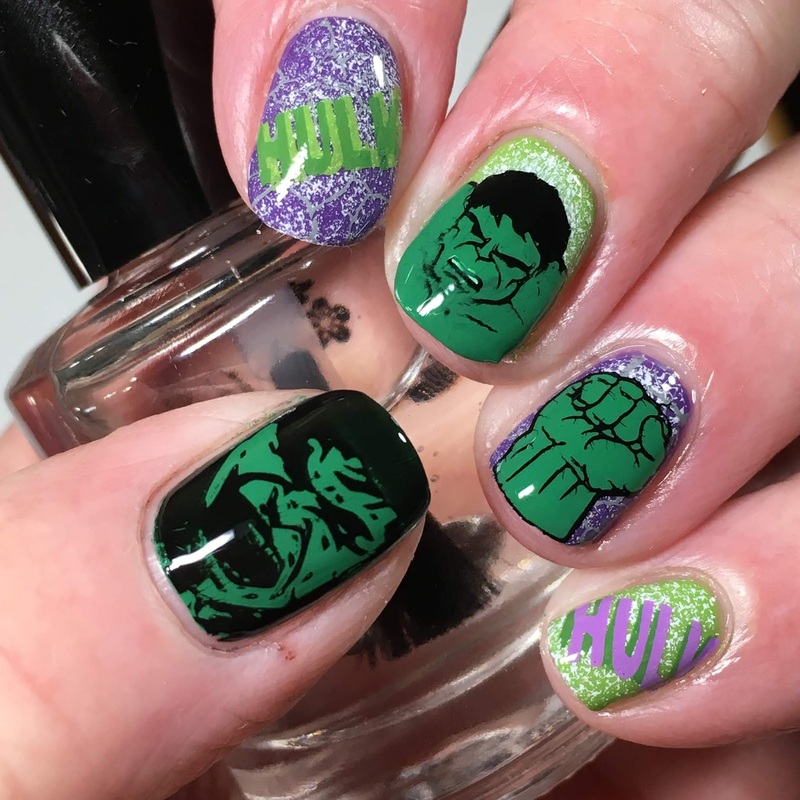 Anyway, DD week ended a week ago and I feel I'm too far behind to finish so I'm going to bow out of my day 5 mani; kinda disappointing as I had one, if not more cool nail designs planned that were inspired by TV shows, but that isn't to say they can't be shared another time! 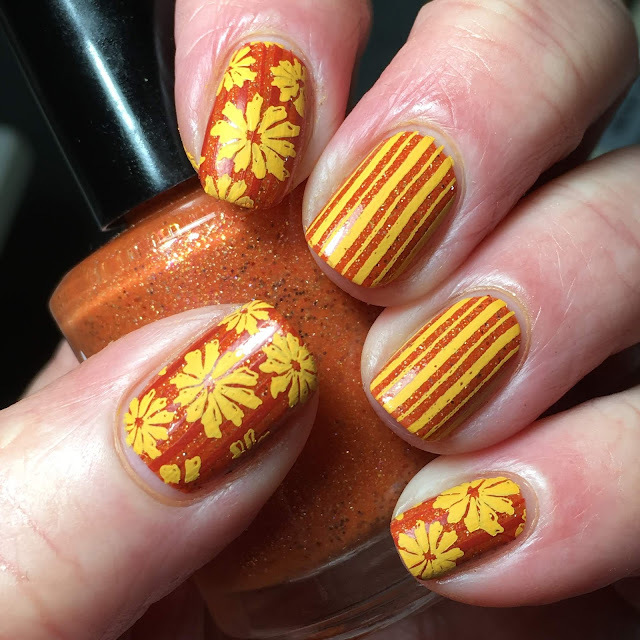 I'm late with my Digit-al Dozen challenge manis; I had two days done but could not upload the pix although I tried and tried for a couple days. Then the weekend came and I was out of town and well, here we are! 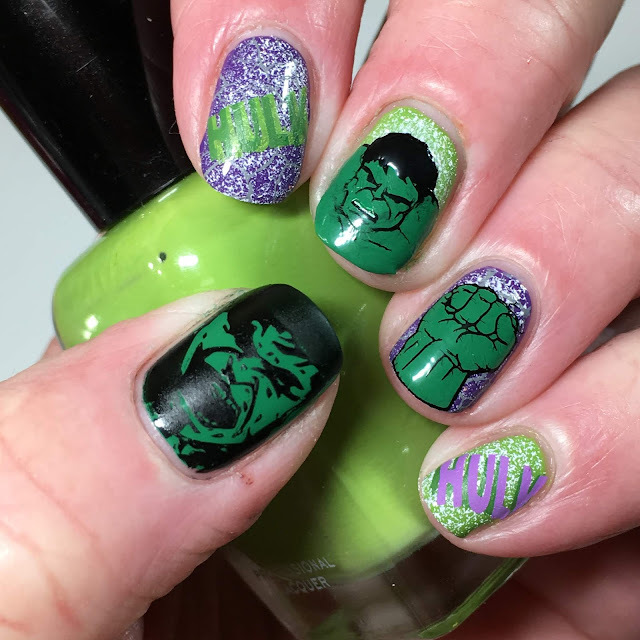 Anyway, this is my day 3 tv show mani featuring The Incredible Hulk! Sponged FunkyFingers Gesso on most of the fingers for some interest and to lighten up the nails for the nail art to follow. 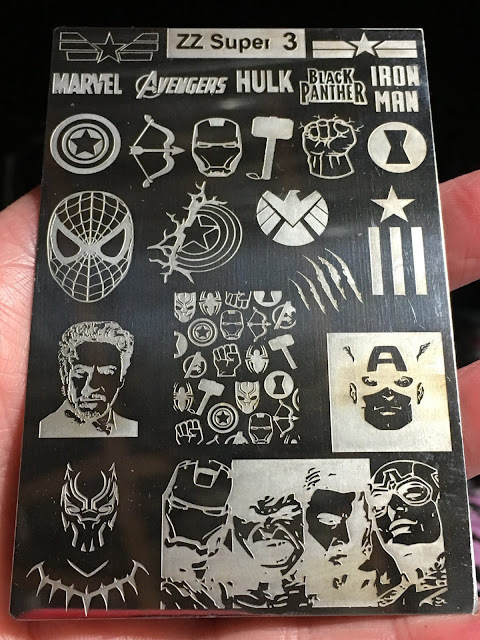 Made stamper decals using FUN 11 (middle) and ZZ Super (index) using CND Green Scene, then double stamped words from ZZ Super 3 using MdU 48, 101 and Painted Polish Stamped in Greenery. Thumb is also from ZZ Super 3. Decided to finish with a coat of My Indie Polish My Perfect Matte. While I related to Billy Bixby and Lou Ferrigno as The Incredible Hulk on TV when I was a kid, my son who is really into the Marvel movie franchise, related these to Mark Ruffalo as the Hulk. 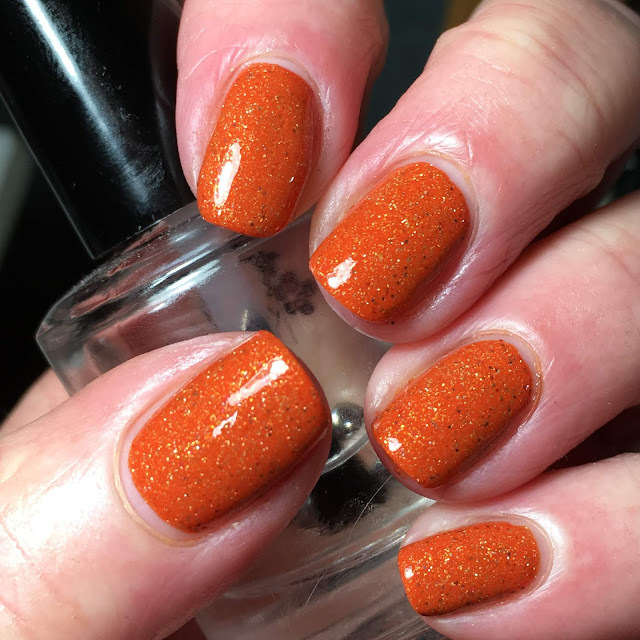 Paint It Pretty Polish Halloween Trio! 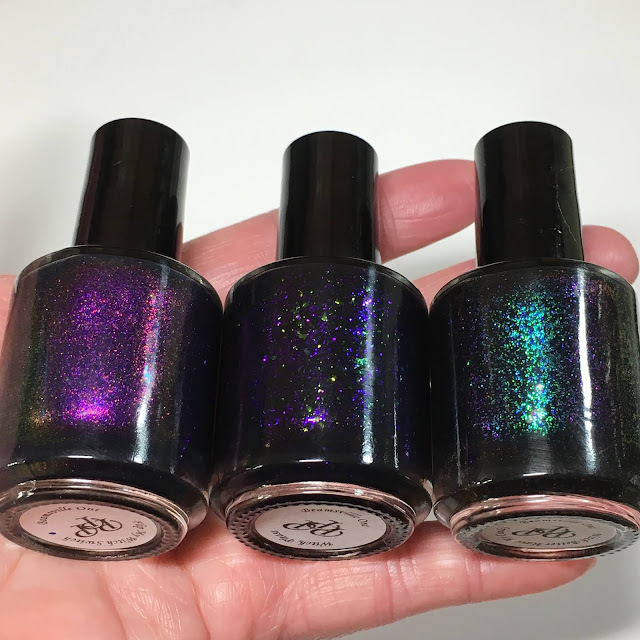 The Paint It Pretty Halloween Trio is available tomorrow, Friday, October 12, 2018 here! Each polish is beautiful in it's own way; there are lots of pictures in this post so grab your favourite pumpkin spice drink before you start reading as you'll want time to check out everything the trio has to offer! Each of the three polishes are perfect for Halloween....or any time of the year if you buck tradition like I do! 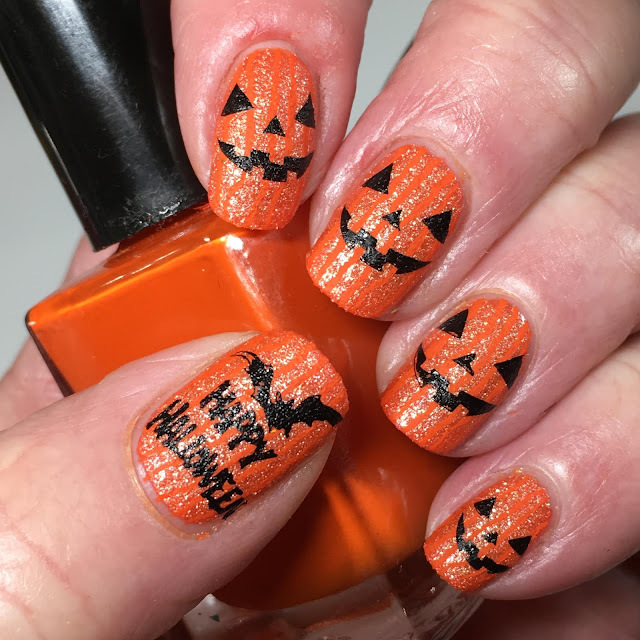 I've also added some fun Halloween nail art throughout the post, hoping that it compliments each polish as Halloween is right around the corner! 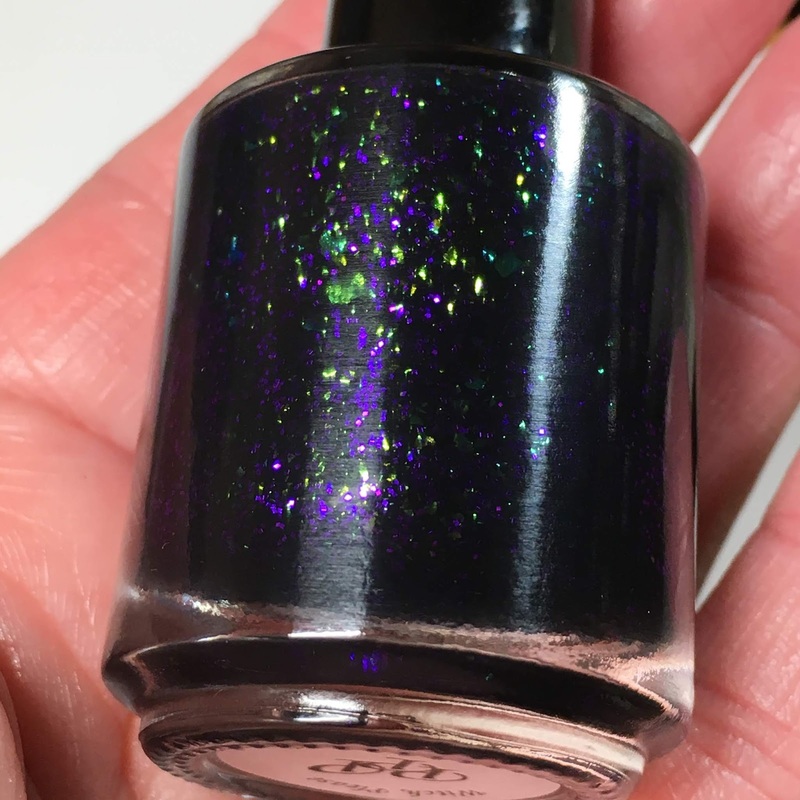 The first polish of the trio that I'm sharing is Paint it Pretty Polish Flip My Witch Switch. 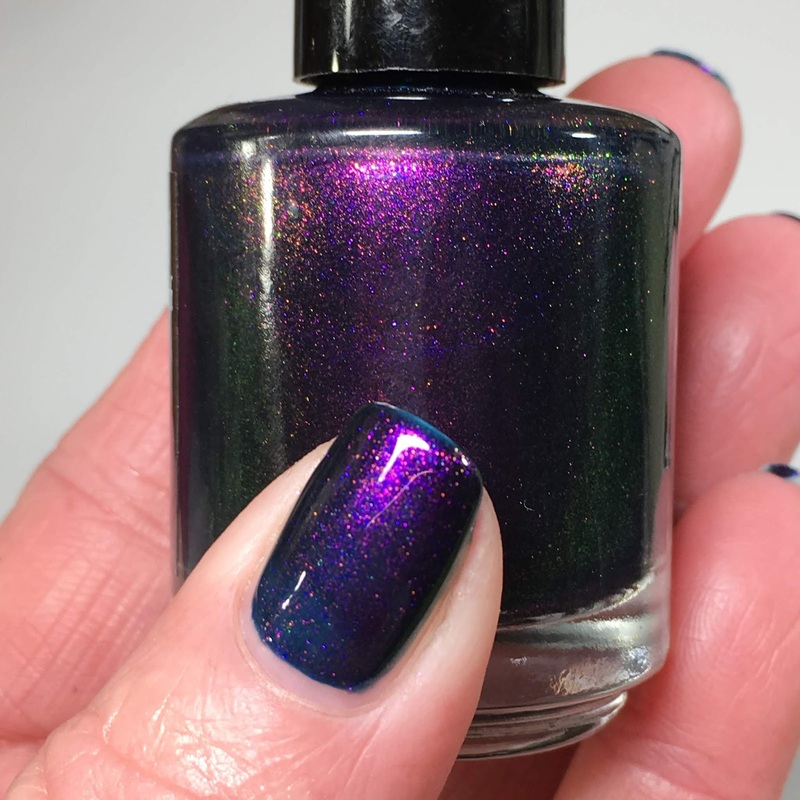 Paint It Pretty Polish Flip My Witch Switch has that gorgeous red/gold aurora shimmer in a navy base. Shown is two easy coats; there were no application or removal issues. No staining of the nail or skin upon removal. 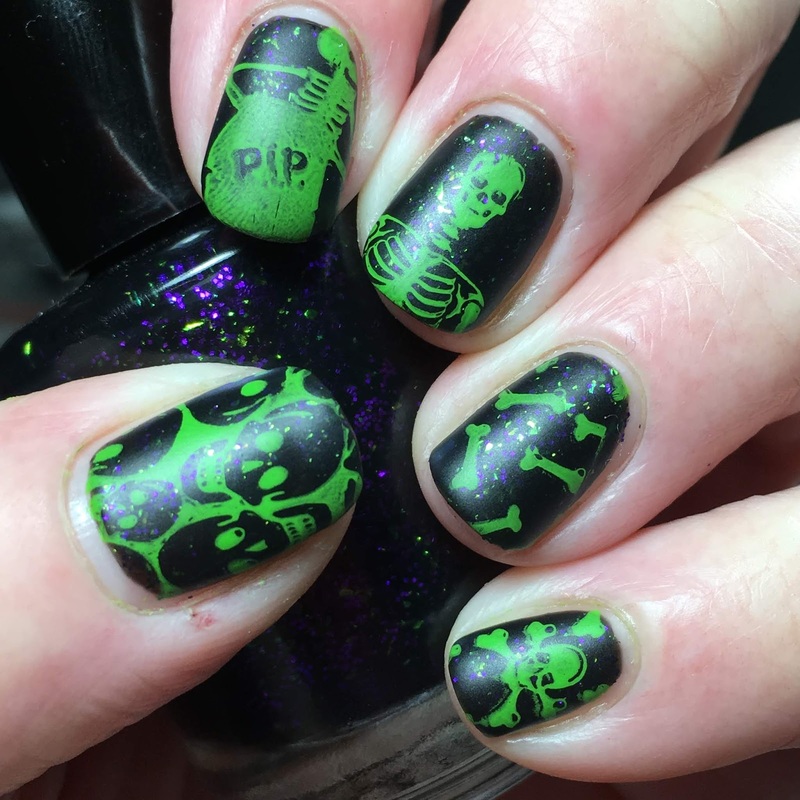 I thought some Halloween themed stamping would be appropriate; stamped images from Bunny Nails HD-G and Lina Spooklicious! 01 using MdU 16, taking care to pick images that would allow the beauty of the base to shine through! 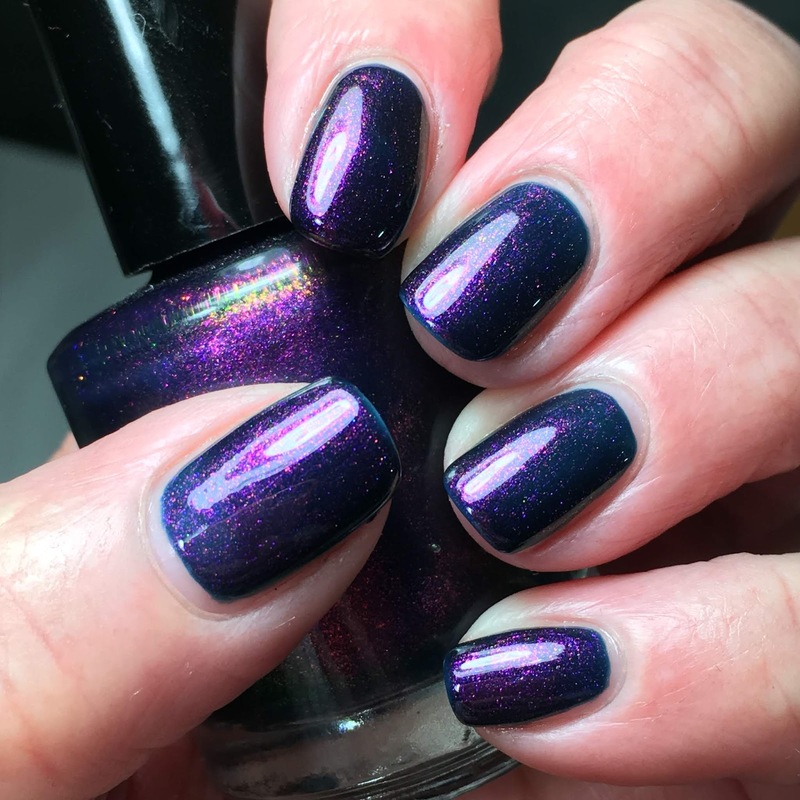 Finished with a coat of My Indie Polish My Perfect Matte. This is Paint it Pretty Polish Witch, Please. 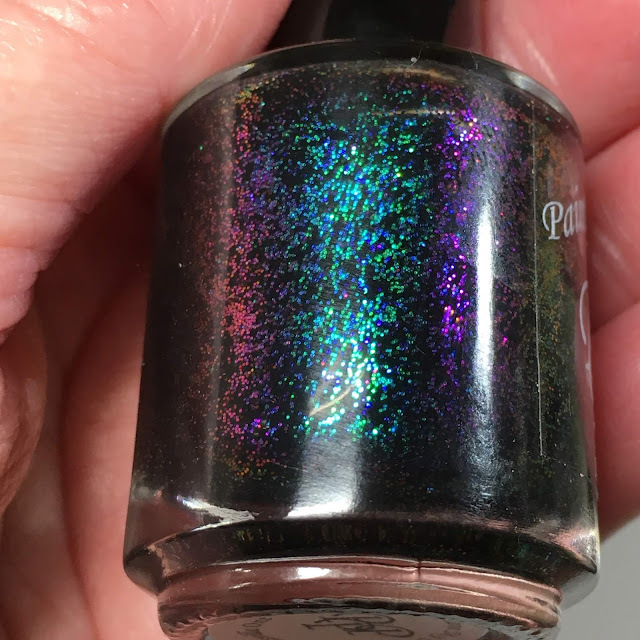 Paint It Pretty Polish Witch, Please has blue/green/yellow chameleon flakies with purple microglitter in a black base. There are a lot of flakies so this polish is just a tad thicker than the others. 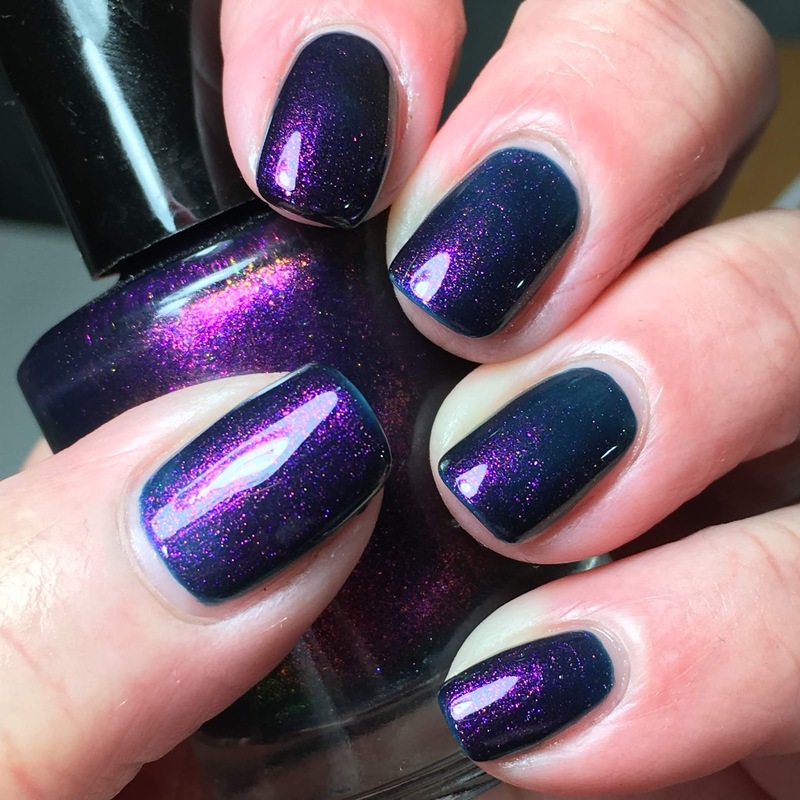 I wanted to show a pix with no top coat to show that that even though there are a lot of flakies, they lay down nicely, although I prefer the gloss of a coat of top coat. There were no application or removal issues. 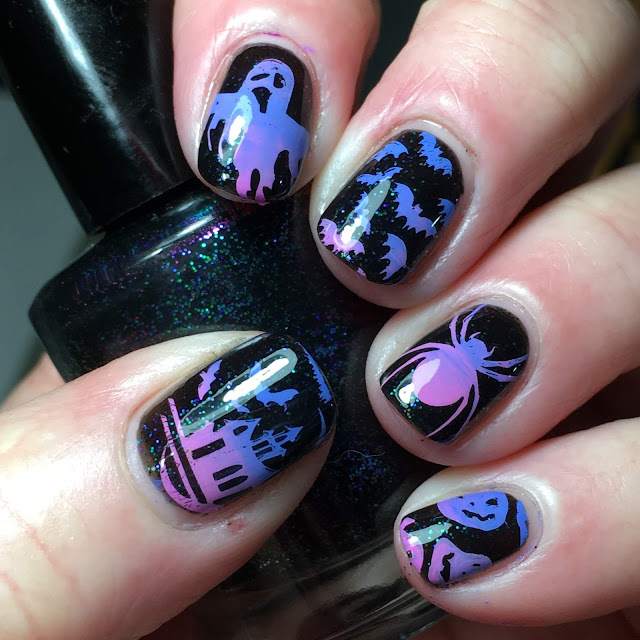 For some spooky Halloween nail art, used images from HD-G (ring), Marianne nails n.115 (thumb), Delaney Halloween 005 (middle) and Marianne Nails n.131 (pinky and index). 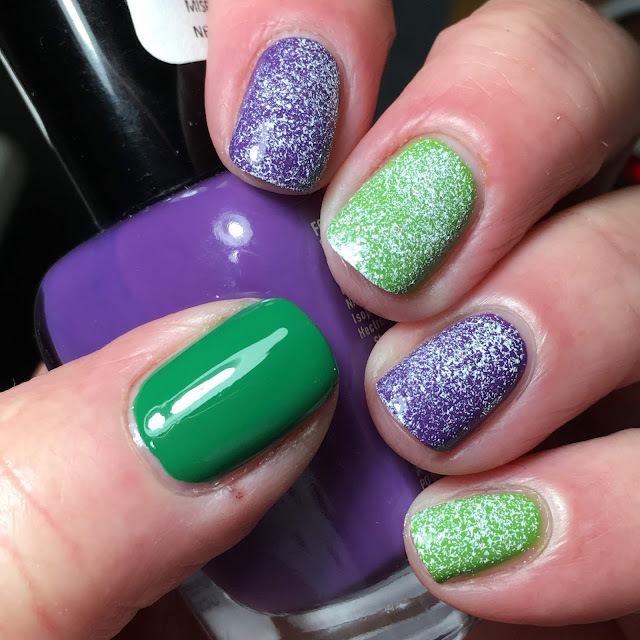 Stamped using MdU 39 to pick up the green flakies and but also goes with the rest of the flakies and microglitter as well! 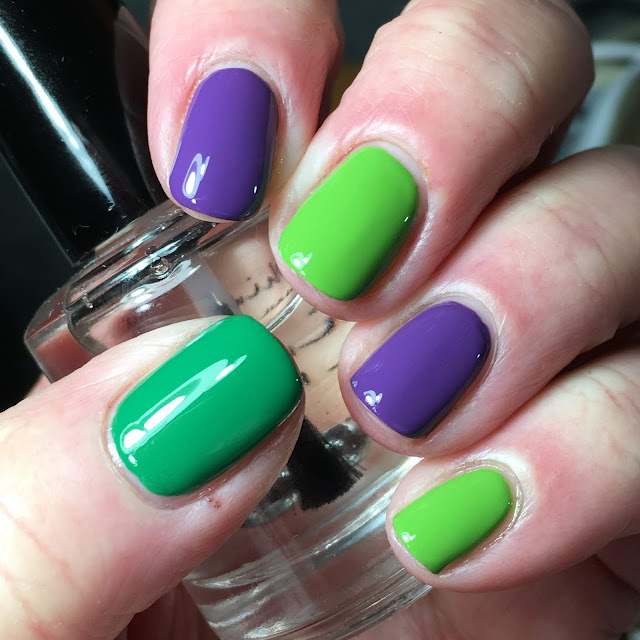 Topped with one coat of My Indie Polish My Perfect Matte that really makes the flakies pop! 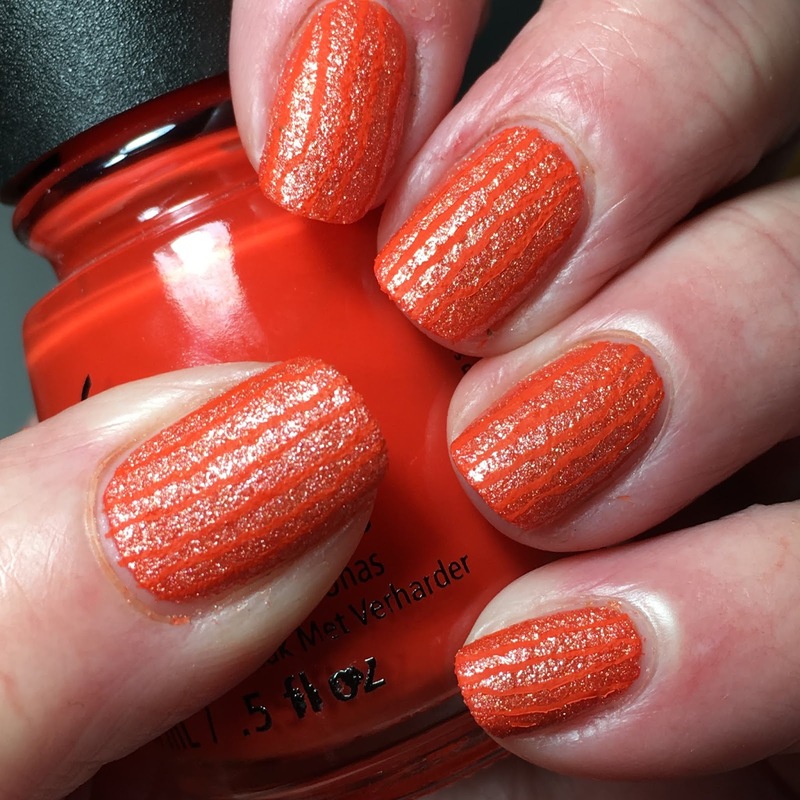 The last polish in the Halloween trio is Paint It Pretty Polish Witch Better Have My Candy. Bottle shot of Paint It Pretty Polish Witch Better Have My Candy. Look at that shift! Paint It Pretty Polish Witch Better Have My Candy is loaded with green, red, purple and blue chameleon glitters. Two coats was good coverage to opaque; there were no application or removal issues. 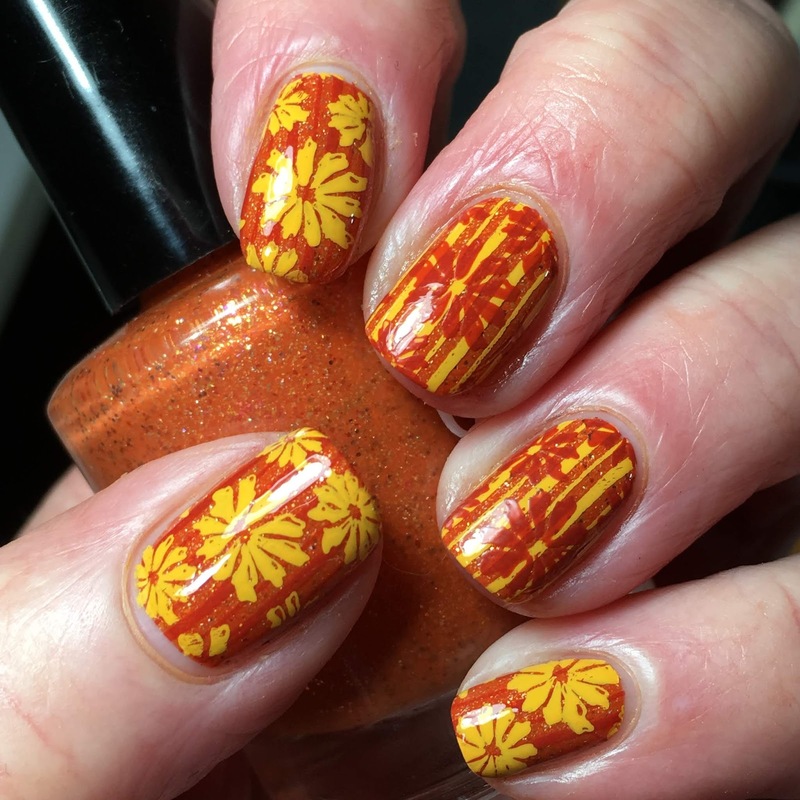 Wanting to compliment the beautiful glitters, did gradient stamping using MdU 49 and 15. Used Lina Spooklicious! 01 (pinky), Marianne Nails n.115 (index), Delaney Halloween 006 (thumb), Marianne Nails n.131 (ring) and Marianne Nails n.117 (middle). I also purposely picked images that allow the base colour to shine through. Topped with a coat of My Indie Polish My Perfect Matte. 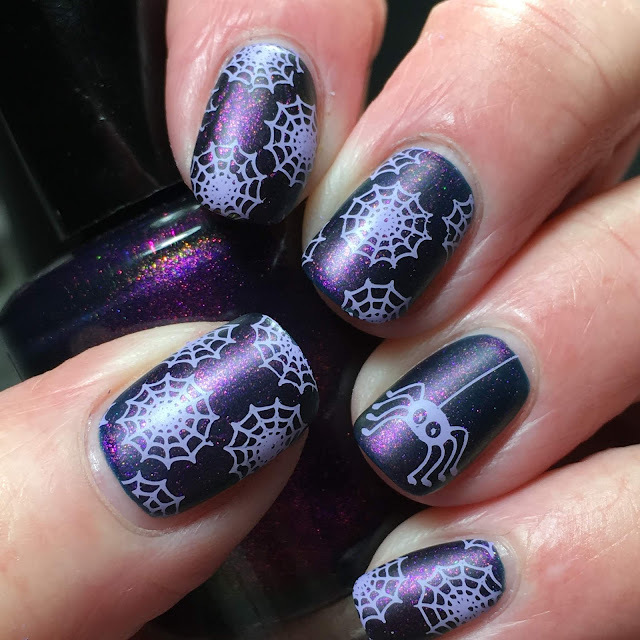 In hindsight and given that each polish has 'witch' in it, I have no idea why I didn't think to do some spooky witch nail art! Thankfully there's time before Halloween lol! Paint It Pretty Polish Halloween Trio** is available on October 12, 2018 here and they will retail for $10. Use code FREESHIPPING at checkout to get free shipping on orders over $90 CND! 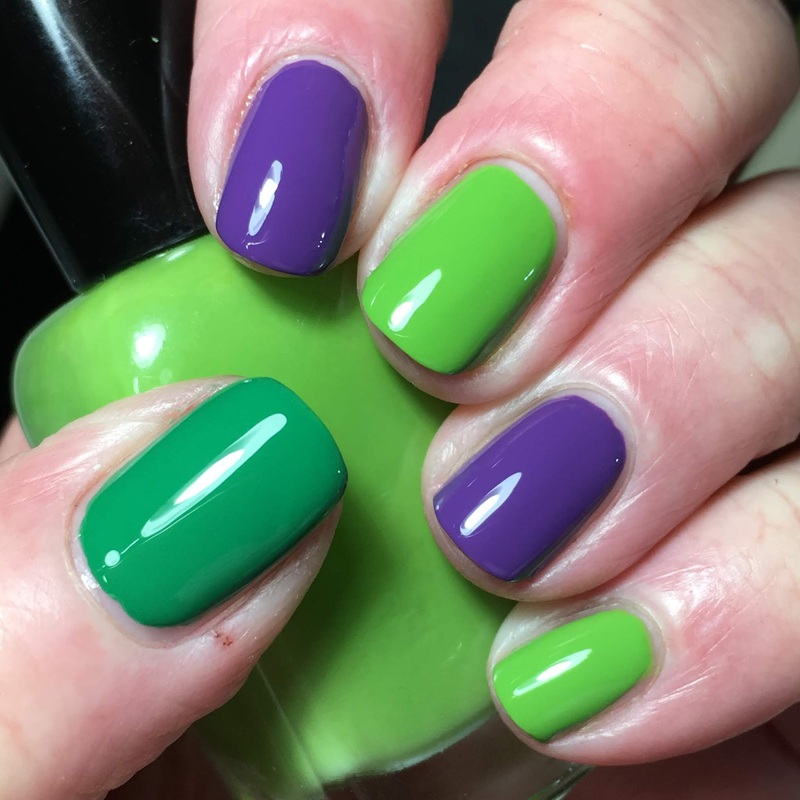 Paint It Pretty Polishes are 5 free, vegan and cruelty free. Thank you to Sherri for the swatching opportunity! It was greatly appreciated! Thanks for looking; have a great weekend! 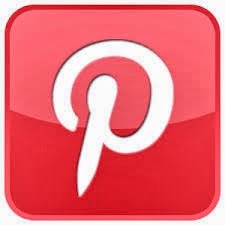 **provided for review; see disclosure policy. 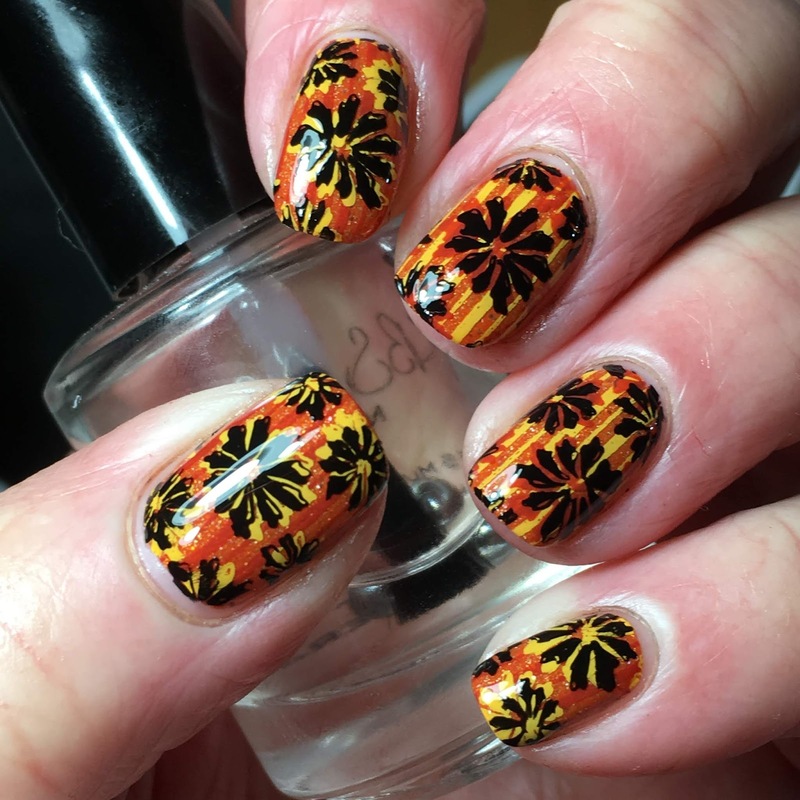 How Many Fall Mani's Is Too Much?? ?